Home / Posts tagged "Ireland"
Ireland defeat Belgium for first international victory in late game thriller. 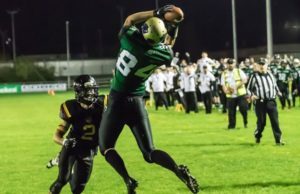 Carrickfergus Knights and Dublin Rebels reach Ireland’s Shamrock Bowl XXXI. Irish American Football League gearing up ahead of playoff weekend. Belfast Trojans reach playoffs with victory over University College Dublin in Irish American Football League. Video Highlights of Centre College, Kentucky’s match with the Belfast Trojans of Ireland.